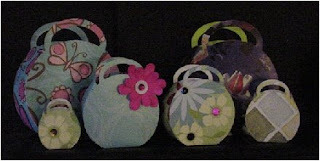 Posted here are some of the design I'm doing using my Plantin Schoolbook Cricut cartridge...I love, love, love the adorable little purses I can make! These were done with some with beautiful rose gift wrap that I spray glued to card stock...on some I've added some additional flowers and leaves and on a few I stamped a design on the inside of the purse for an additional design touch. 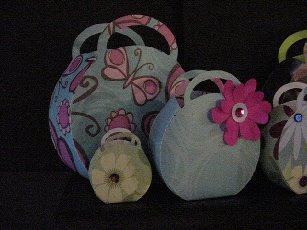 Adding more purses...they are a perfect touch for giving a special gift...earrings, a necklace or a gift card.